We learn, in the second chapter of A Study In Scarlet, that Holmes was proficient in playing the violin and Watson references Mendelssohn. 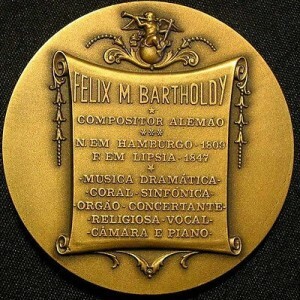 Jakob Ludwig Felix Mendelssohn Bartholdy, born and generally known as Felix Mendelssohn (February 3, 1809 – November 4, 1847) was a German composer and conductor of the early Romantic period. He was born to a notable Jewish family, being the grandson of the philosopher Moses Mendelssohn. 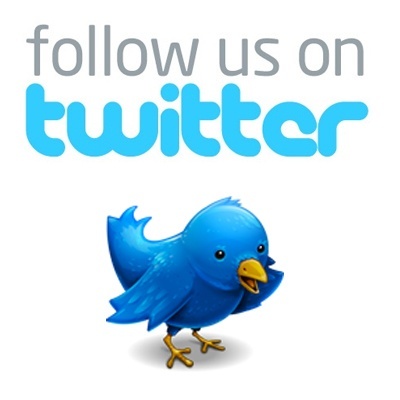 His work includes symphonies, concertos, piano and chamber music. Due to changing musical tastes and anti-Semitism in the late 19th and early 20th centuries, Mendelssohn’s music became somewhat out of favor. His creative originality is once again being recognized and re-evaluated, and he is now among the most popular composers of the Romantic era. 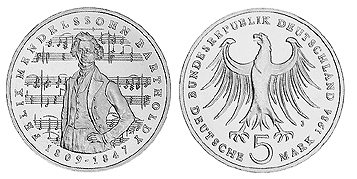 The Federal Republic of Germany (aka East Germany) commemorated the 175th anniversary of Mendelssohn’s birthday in 1984 with this 5 mark coin. Struck in Copper-nickel clad nickel, this 29mm coin carried an inscription on its edge of IHR TÖNE SCHWINGT EUCH FREUDIG DURCH DIE SAITEN. 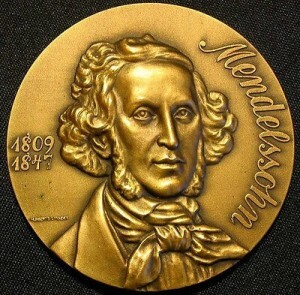 This 80mm bronze medal is one of a series of medals honoring famous musicians and composers. 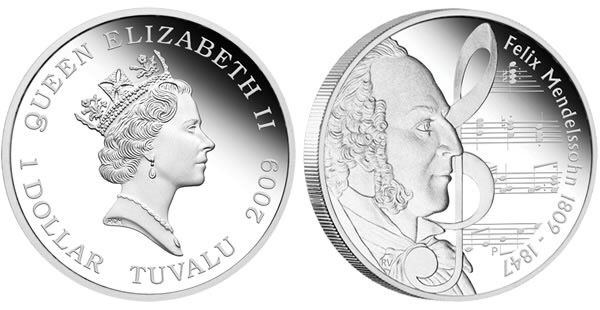 The country of Tuvalu, which gave us the 2014 Sherlock Holmes / Gloria Scott dollar as part of it’s Ships That Never Sailed series and the 2011 Sherlock Holmes and Professor Moriarty dollar of the Heroes and Villains series, honors Mendelssohn in 2009 as part of their Great Composers series. To close out this post, we present a brief sampling of Mendelssohn’s Lieder. Close your eyes and imagine sitting in the rooms at 221b Baker Street….